Myth: “a person or thing having only an imaginary or unverifiable existence. An ill-founded belief held uncritically esp. by an interested group” (Webster’s Collegiate Dictionary). First to clarify: The Al Aqsa Mosque itself is not a myth. It is located in Jerusalem on what the Jews call Temple Mount and what Arabs refer to as the Noble Sanctuary, which also includes the more well-known structure, the Dome of the Rock. Many, including a large number of Muslims themselves, confuse Al Aqsa Mosque with the Dome of the Rock; they are different buildings. I’ve personally walked on Temple Mount, right up to the steps of the Dome of the Rock, but I did not approach the mosque. So, too, do Palestinian Arabs claim Jerusalem as theirs. In fact, they think all of Israel belongs to them. It is predominately the Al-Aqsa Mosque that rivets Muslim attention, and generates overt Arab hostility against the Jews, such as intifada. Muslims contend that Temple Mount does not belong to the Jews, partially because it is the third holiest location in Islam. 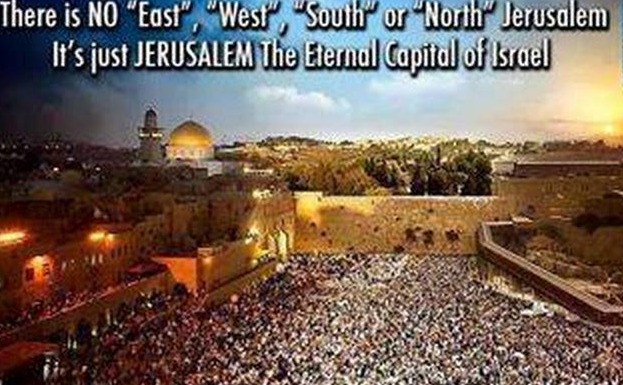 Never mind that Temple Mount is the HOLIEST place, the most sacred of all sites to Judaism and the Jews! That’s irrelevant to the Arabs and seemingly to much of the world. As a result of blatant lies from none other than Palestinian Authority President Mahmoud Abbas, who incited his people by falsely accusing the Jews of desecrating or intending to desecrate holy sites in Jerusalem (especially Temple Mount), young Palestinians instigated their “knife intifada” last October. These lone wolf attacks which also included car rammings, Molotov cocktails, and shootings soon became a concerted effort by individual Palestinians to kill as many Jews as possible. Thankfully, the number of attacks have subsided. It’s crystal clear that the two intifadas, the BDS movement, the insidious propaganda—that fosters a heart of hatred and a mentality of murder in their children through indoctrination beginning in elementary school—are all part and parcel of Palestinian intent to protect the Dome of the Rock and Al-Aqsa Mosque from “the filthy feet of the Jews” (as Abbas stated in an attempt to incite Palestinian uprisings). Some, and I agree with them, have gone so far as to say that without misguided Palestinian passion for and unwarranted defense of their Temple Mount claims, there would be less violence in Israel. Indeed, there would be minimal cause (excuse) for the Palestinians to launch their intifadas or a basis to justify (rationalize) their actions to the world other than dishonest assertions of Jewish takeover or desecration of the Dome of the Rock and Al-Aqsa Mosque. Oh, there’s always the allegation of Jewish “settler occupation” of the West Bank, but those inaccurate accusations have been going on for decades. The latest Palestinian choice of confrontation centers on the more ancient and ostensibly more religious rationale that protection of the Noble Sanctuary supposedly supports their agenda to harass, terrorize, and attack the Jews. First, however, I would like to present some excerpts from one of several Eye of Prophecy articles that touch on the subject of Jewish versus Arab history, regarding Israel. In italics the following excerpts are from the Eye of Prophecy article, A Palestinian State? (No, Say Many Arabs), published 1-11-14. Let’s continue today’s article by looking more closely at the history of Al-Aqsa Mosque in the context of two other (holier) places in Islam. 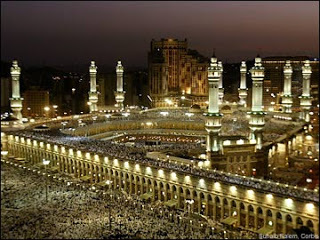 Mecca: Site of the Kaaba (including the Black Stone) and the AL Haram Mosque. According to Muslim tradition, Abraham and his son, Ishmael, built the Kaaba as a symbol of the house of God, at which time God (Allah) established the Hajj rituals. Obviously, such an event can be found nowhere in the Bible, which is the case for nearly all Muslim writings or traditions. Whenever Muslims refer to Abraham, he is always (only) the father of Ishmael. Rather, than Isaac, who Scripture unequivocally declares is the Promised Child chosen over Ishmael … the child who would continue the Jewish Race and be the ancestor of the Messiah. Nor is there any evidence of Abraham ever being in Mecca. In short, it is a tradition that is not affirmed by historical records, including any such reference to the Hajj. That came later after Mohammed started the Islamic religion. Medina: Next in line of the most sacred sites is the Masjid Al Nabawi Mosque, built by Mohammed next to the house where he lived, with his tomb located in the mosque. Muslims normally include this mosque in their Hajj pilgrimage to Mecca, required of every able-bodied Muslim at least once in their lifetime. 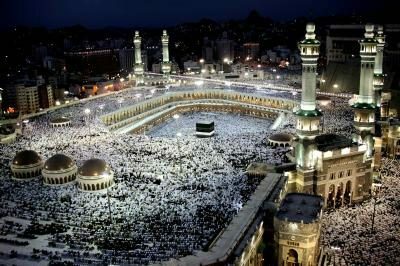 According to Mohammed, Allah commanded him to reinstate all of the rituals of Hajj just as (also according to Mohammed) they were established by Allah through Abraham. Again, there is no historical record of such rites until the time of Mohammed. But that is the case with most of Islam, i.e. invention or reinvention of Biblical history to suit this new religion, which (in a Johnny-come-late fashion) surfaced over 2,500 years after God called Abraham to be the father of the Jewish nation and over 1,500 years after King David made Jerusalem the capital of Israel. Jerusalem: The first two holiest places in Islam are understandable given the history that Mohammed and the Arabs lived in Saudi Arabia, particularly Mecca and Medina. However, Jerusalem as the third holiest Islamic site is utterly baffling (more like implausible), beginning with the Al-Aqsa Mosque itself. In Arabic, Al-Aqsa simply means, “the farthest.” Both the Dome of the Rock and the Al-Aqsa Mosque were built AFTER Mohammed allegedly had been whisked away from Mecca to Jerusalem in one night’s travel, then ascended to heaven from the Noble Sanctuary. Despite Muslim attempts to rewrite history by maintaining that neither Solomon’s nor Herod’s Temple ever existed or if they did exist not on Temple Mount, Biblical and secular history overwhelmingly proves otherwise. Let’s look at some dates and sequence of events to see how they match up with the Islamic narrative … whether Mohammed even set foot in Jerusalem, thereby, making it holy only to Muslims for that reason alone. Mohammed was born in 570 AD and died on June 8, 632. 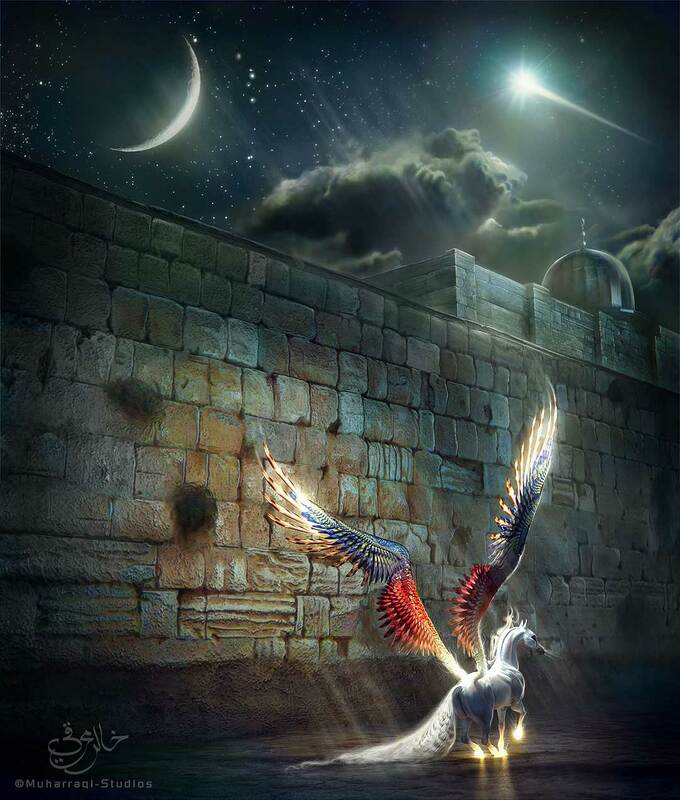 In the year 620, he was said to have travelled from Mecca to Jerusalem on a winged steed, from where (Temple Mount) he visited both heaven and hell. Whereas, there’s no real problem with these dates, there are enormous inaccuracies with the rest of the story. The dilemma begins with the historical evidence that the Al-Aqsa Mosque was built in 696 AD by Khalif Abdul-Malik Ibn Marwar who had earlier built the Dome of the Rock; or in 705 AD by Mohammed’s son, in memory of Mohammed’s magical journey. Whichever date is accurate, neither can accommodate the timeline of Mohammed’s fanciful journey. The reason: the after-the-fact story told by Mohammed’s followers is that the “farthest” mosque was purportedly located in Jerusalem. Question: How could Mohammed have travelled to a (any) mosque in Jerusalem in 620 AD when, in fact, there wasn’t a single mosque in Jerusalem until the Al-Aqsa was built decades later?! Although this Quranic verse mentions a night trip made by Mohammed (servant) from the Sacred Mosque in Mecca to “the remote mosque,” it does not actually specify that this farthest mosque was in Jerusalem, or even that Mohammed then ascended to heaven. Moreover, when the Al-Aqsa was built to commemorate this enigmatic expedition (to another far away mosque that didn’t exist in Jerusalem), Muslims eventually designated Al-Aqsa as the actual remote mosque referenced in the Koran! Talk about arguing in a circle (circular reasoning)! There’s more. Initially Islamic scholars firmly believed that the farthest mosque was a metaphor, signifying some unknown place between heaven and earth, not a specific physical location. In his earliest biography, Muslim historians depict Mohammed’s passage to heaven as a spiritual one only; additionally, this journey (in spirit) was directly from Mecca to heaven, not from Mecca to Jerusalem, then to heaven. Apparently, in the effort to make Mohammed’s mystical travels more plausible, Muslim historians changed the story to that of a physical pilgrimage to the farthest mosque or the “remote mosque” which they later decided should be in Jerusalem, that didn’t have a mosque until some 70-80 years afterward—what is now called the Al-Aqsa Mosque. ‘Where would that lead us?’ asked the host. *Note: Only Messiah Jesus, the Prince of Peace, can and will bring lasting peace to Israel and to the world. Nevertheless, Zeidan’s response was on track. At the very least the Palestinians could/should no longer use religious heritage—based on the myth that the Al-Aqsa (or any mosque) had been visited by Mohammed in Jerusalem—to claim superiority over Jewish rights to Temple Mount, with Judaic jurisdiction meticulously documented by both Biblical and secular history and by archeological evidence. During subsequent control of Jerusalem by the Crusaders, then again by the Arabs (Saladin) then the Ottoman Turks followed by the British in 1917, the Dome of the Rock gradually fell into disrepair. This and other historical evidence (factors) demonstrate that neither Muslim Arabs in surrounding countries nor even Palestinian Arabs in Israel placed much significance at all on their Noble Sanctuary. That is, not until Jews recaptured all of Jerusalem including Temple Mount during Israel’s spectacular Six-Day War victory. That changed everything. Since then, Palestinians have hotly disputed the rights to Temple Mount; including, but not limited to, their non-negotiable contention that Jerusalem (at least East Jerusalem) belongs to them and will be the capital of a Palestinian State. Likewise, most Israelis contend that Jerusalem is the eternal capital of Israel, and must never be divided into two capitals, or divided at all. The British understood how little significance Arabs placed on Jerusalem when they did not include the city as part of assigned Arab territories preceding the Balfour Declaration of 1917. Whatever (minimal) importance the Arabs placed on Jerusalem didn’t matter, as they turned down the partitions of the Balfour Declaration as well as the portion of Israel allocated to them in the United Nations resolution of 1947. The historical record is unmistakable: It’s not that the Arabs desperately wanted Jerusalem or control of Temple Mount (not until 1967). In fact, they had marginal interest in Jerusalem, and did little to maintain or improve the city’s infrastructure for hundreds of years. Ever so sadly, the conflict continues. Anti-Semitic animosity toward Jews has intensified not only in Muslim nations, especially Iran, but also in Europe and even the United States. Palestinian Arab hostility incessantly manifests itself in deceitful and sometimes absurd ways. Please refer to Eye of Prophecy article entitled Israeli Occupation … Fact or Myth? Posted on 5-16-15. 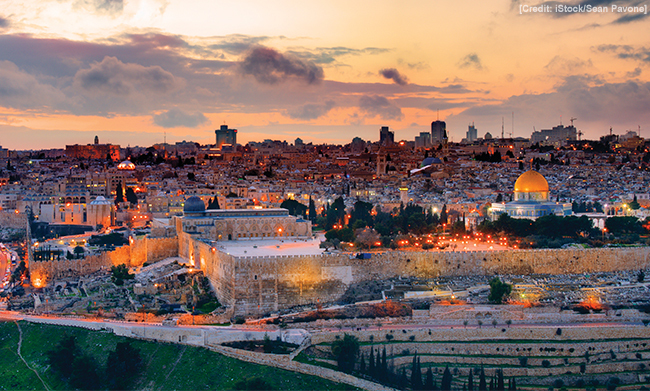 Also, Jerusalem … A Capital without a Country, published 6-13-15. What pretext? There is no pretext. The cameras will be monitored by Jordan as guardian over Temple Mount, which directly undermines the PA claim that Temple Mount authority belongs to them by virtue of the Al-Aqsa Mosque being there. 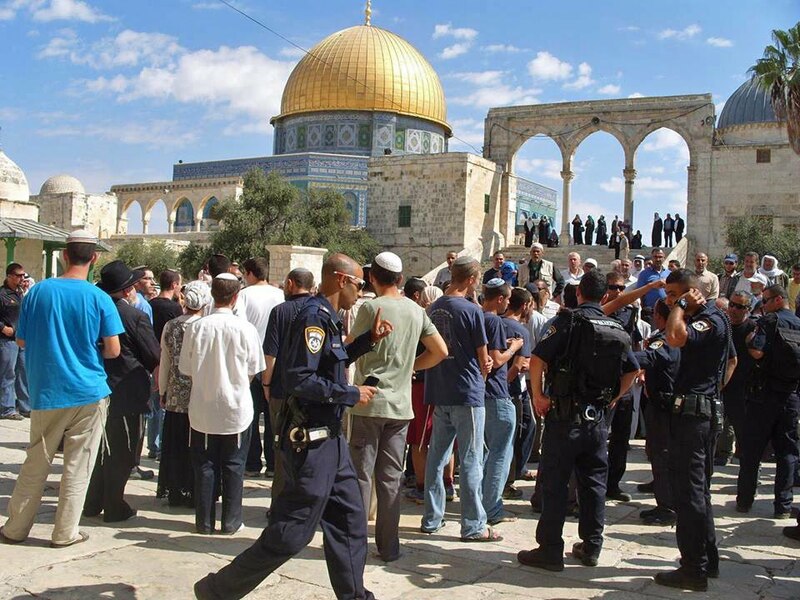 Moreover, the surveillance would clearly show that no Israelis are “desecrating” anything on Temple Mount nor is the Al-Aqsa Mosque in any “danger” as preposterously alleged by the PA. Nor is there any “plot” by the Jews to change the “status quo” on Temple Mount. Conversely, the cameras would expose the constant harassment of Jews on Temple Mount by Palestinian rioting, particularly during Jewish holidays. Yes, the Al-Aqsa Mosque is a myth. Not its current existence; rather the supposed ancient connection of Islam to Jerusalem based on Muhammad’s alleged travel to a “remote” mosque that didn’t exist at the time in Jerusalem. Muslim scholars also said that Israel was the “nearest land” to Mecca. Which is it … nearest or farthest? It can’t be both. Actually it’s neither. And, of all things, why wouldn’t Mohammed, himself, have included this miraculous journey to heaven in the Koran? A strong clue to the answer: Just like the Koran contains no real miracles or fulfilled prophecies (of which the Bible is replete with both), Mohammed and his followers couldn’t risk the possibility that such a tale contained in the Koran might be disproven in succeeding generations. Yet, Islam in general and Palestinian Muslim Arabs in particular base their rights to Temple Mount exclusively on this illusion. If their claim is even remotely possible, you would think that their holy book, the Koran, would mention Jerusalem just one time. But it doesn’t, and the reason is obvious: Not until 1967 did Muslims or Arabs give a hoot about Jerusalem, let alone contend that Jerusalem belongs to them and must be the capital of the Palestinian State. 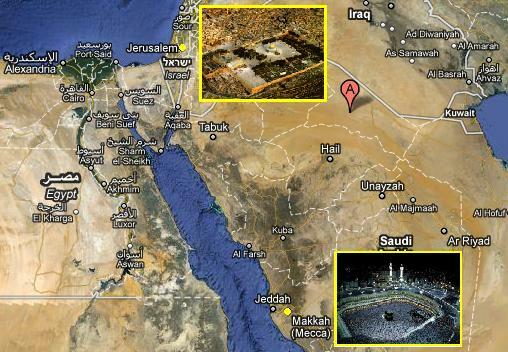 Even Mecca, the most sacred site of Islam, is not the capital of Saudi Arabia! Nor is Medina! Where, then, does Jerusalem really rank in Islam? But the Bible is not a myth. Hundreds of prophecies concerning Messiah were fulfilled in Jesus Christ and the return of the Jews to Israel. More remain unfulfilled until the glorious Day of the Lord, which is nearly upon us. The God of Abraham, Isaac, and Jacob, the God of all who have believed and received his Son, Messiah Jesus … He is the true and living God. He made man (and woman). All other gods are man-made. His promises are forever true … worthy of our trust! His glory is great … worthy of our praise! What the Lord says will happen, happens. What he says he will do, he does. “The Lord says, ‘Shout and rejoice, O beautiful Jerusalem, for I am coming to live among you. Many nations will join themselves to the Lord on that day, and they, too, will be my people. I will live among you and you will know that the Lord of Heaven’s Armies sent me (Messiah Yeshua) to you. The land of Judah will be the Lord’s special possession in the holy land, and he will once again choose Jerusalem to be his own city. Be silent before the Lord, all humanity, for he is springing into action from his holy dwelling’” (Zechariah 2:10-13).